Easy MTD VAT enables you to comply with HMRC's Making Tax Digital (MTD) for VAT without the need to change or upgrade your accounting software. If your VAT return figures can be contained in an Excel spreadsheet or a CSV file then Easy MTD VAT can be used to submit them digitally to HMRC in just a few clicks. Not only that, the software also allows you to view VAT obligations, liabilities and payments. If you need to submit just one or hundreds of VAT returns to HMRC, our token-based payment plan makes Easy MTD VAT one of the most cost effective solutions available. 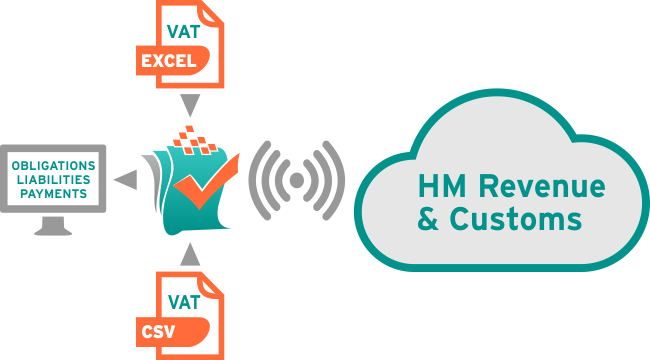 Download Easy MTD VAT to manage your VAT and submit your VAT returns to HMRC today! Submit VAT returns digitally to HMRC and view VAT obligations, liabilities and payments. Easy MTD VAT can submit VAT return figures contained in Excel spreadsheets and CSV files meaning it can act as a bridge between almost any accounting system and HMRC. The Easy MTD VAT interface is so straightforward your VAT data can be viewed and submitted in seconds. Easy MTD VAT is compliant with HMRC's Making Tax Digital (MTD) for VAT platform and is listed on the HMRC "Software for VAT" portal. View VAT obligations, liabilities, payments and returns for free, and buy tokens from as little as £0.99 to submit VAT returns digitally to HMRC. Whether you're a business that needs to submit their own VAT return or an agent who needs to submit hundreds, Easy MTD VAT is the perfect solution.